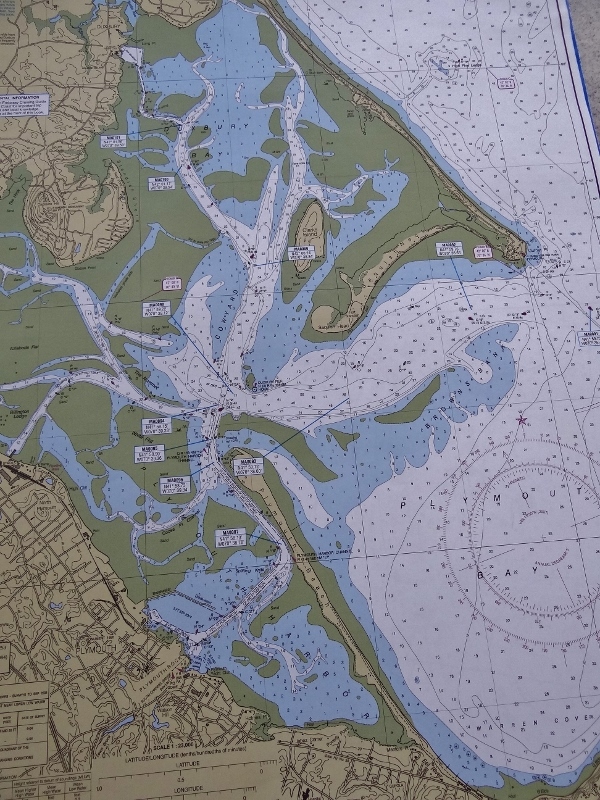 The mooring field for Duxbury is in that white kite-shaped square in the upper left. A channel diverged, and we turned right. 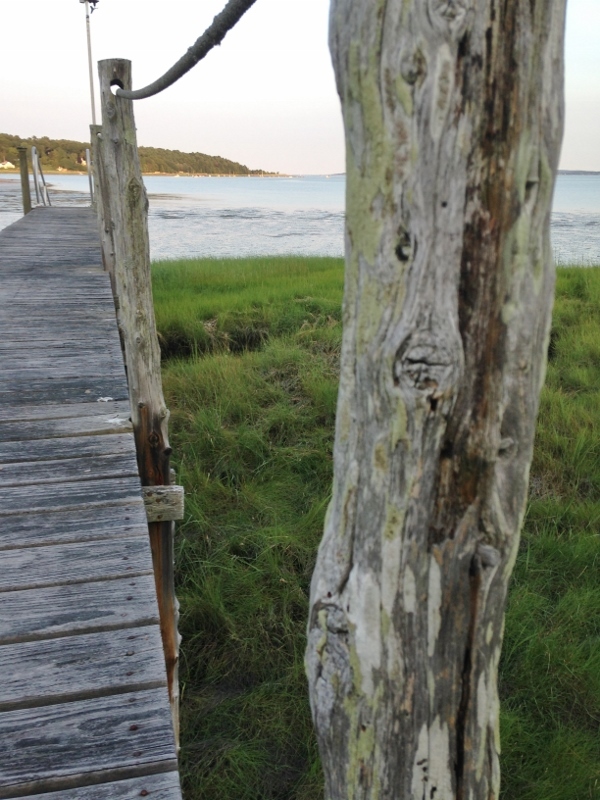 Turn left into Plymouth or bear right into Duxbury. 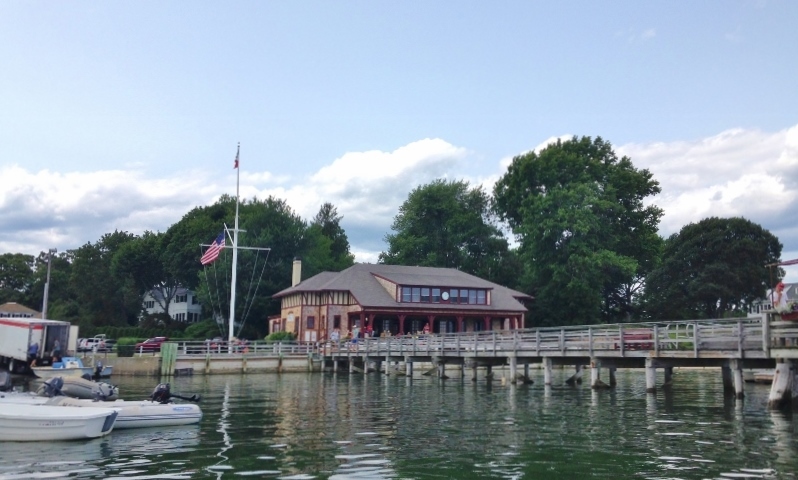 Both are steeped in Mayflower history and both have plenty to offer a boater; just depends on what you are looking for and maybe just a bit of who you know. A few years ago we got invited, along with our son, to visit “the old house” on Clarks Island located behind Saquish as you enter the channel. Our primary reason for stopping here was to have that once-a-year meet-up with our friends Linda and Glenn on s/v Indigo who you have read about here before. We came so close in Great Bridge, VA where Indigo was going to hang out for, well I am not sure of the original intentions but she didn’t head for home until late July! 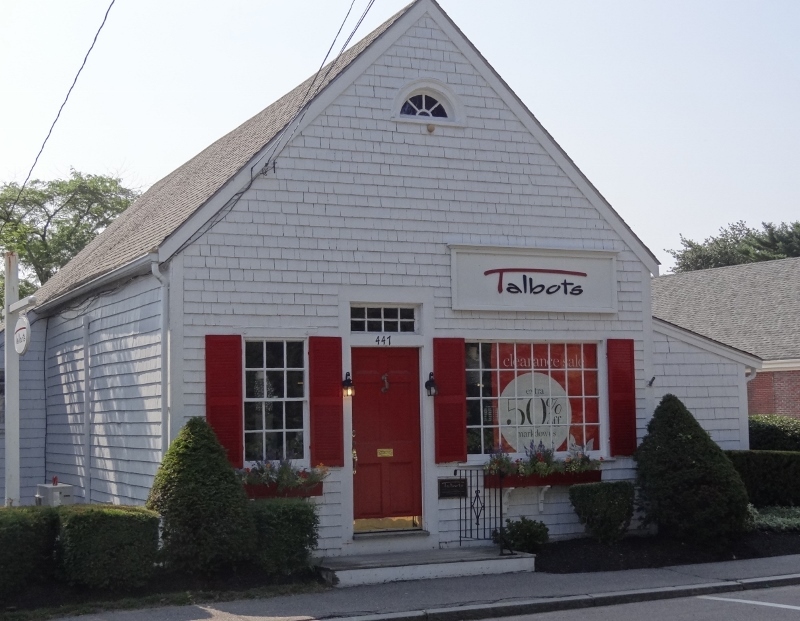 Duxbury is such a quietly classy place with at least seven commercial oyster operations and one of the first Talbots; what’s not to love? Duxbury was our first stop on the canal’s “other side” where the tide range is extreme (9ft compared to the 2-4ft we are used to) and only a picture can adequately describe how that looks. The temps are even cooler, not that we needed it. Has been a very cool and comfortable summer, temperature-wise thanks to the regular cold fronts that keep pushing across bringing rain, TSs and moderating the not-very-hot anyway temps. 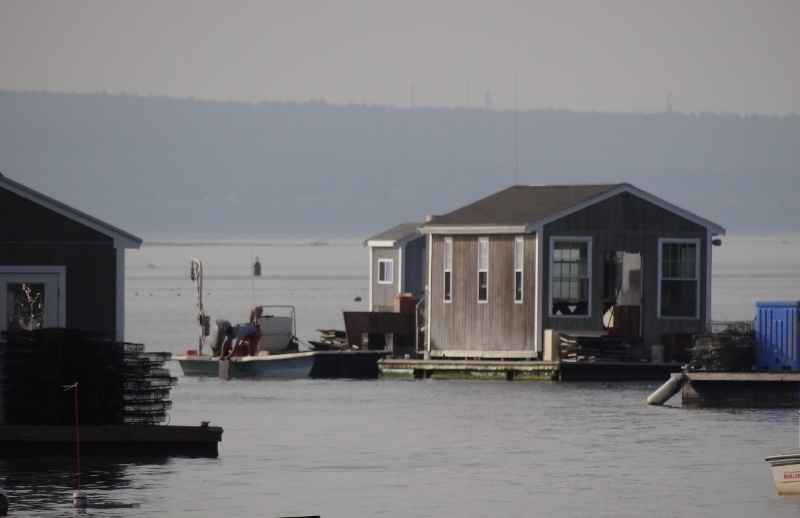 The Duxbury Harbormaster is a busy office with several boats and a late-model truck. 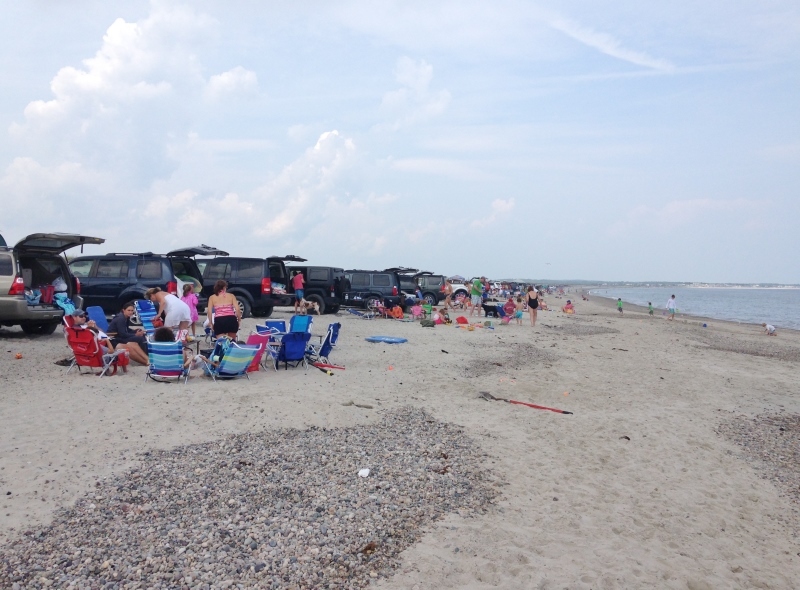 In addition to harbor duties, the very long Duxbury Beach is under their purview. 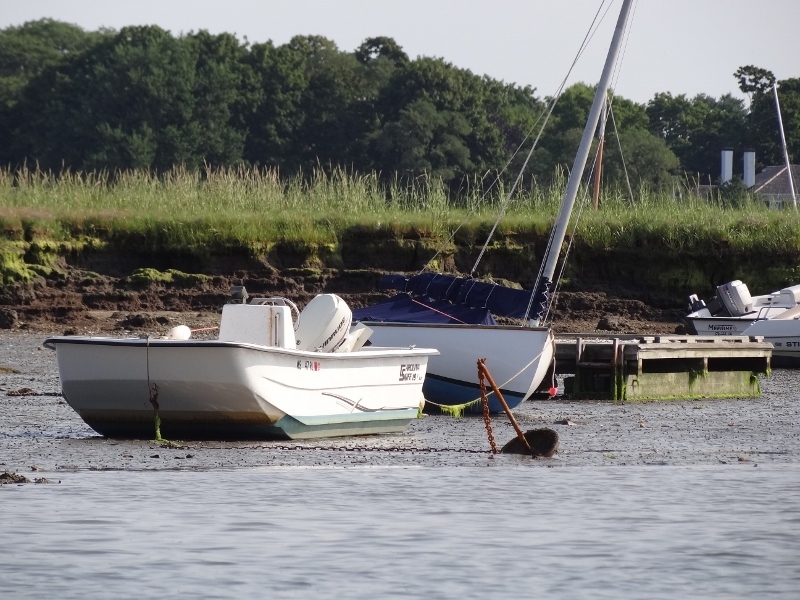 Moorings are all privately owned, with some being owned by members of the DYC. We were assigned a ball in the limited big boat section. At high tide the spacing looks acceptable but at low tide you’ve got more scope and if the wind dies things could go bump in the night- because that’s when they always do, right? Russ has expressed this concern at many of the mooring fields this trip, but so far no problems. Yet. 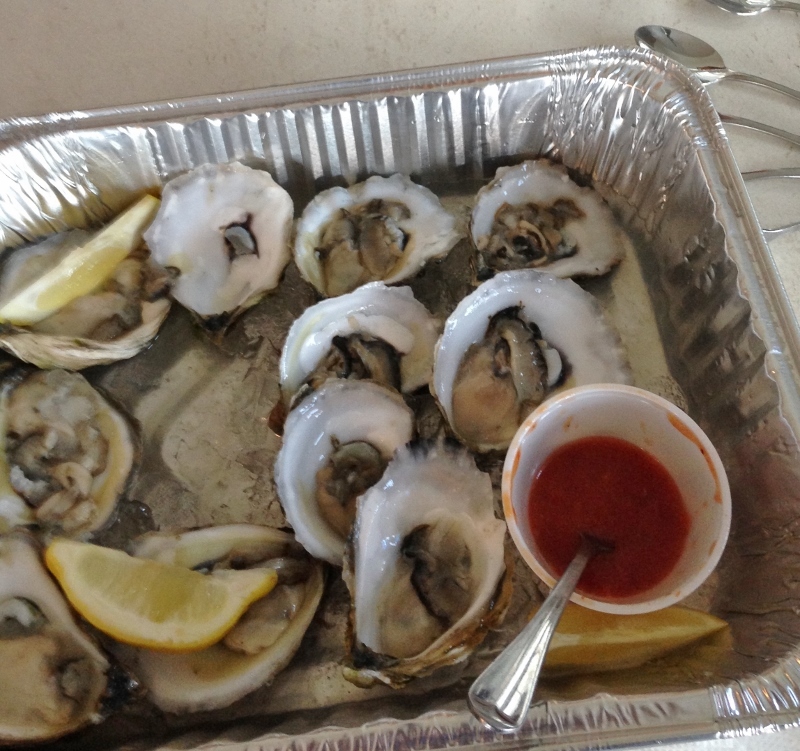 Wednesday evening was delightful, the Duxbury oysters delicious. Our hosts along with a close friend and Glenn’s sister couldn’t have made us feel more relaxed and at home. A G&T in one hand and shucking corn with the other- I felt so useful in Linda’s spacious new kitchen. The roasted corn was excellent. Remove the tough outer husks, leaving a layer or two of the lighter inner ones. Remove silk and brush the kernels with a mixture of chopped fresh herbs and EVOO. Use a strand of long husk (peel it a narrow width) to wrap around the ear and keep the husks fastened. Grill and enjoy. 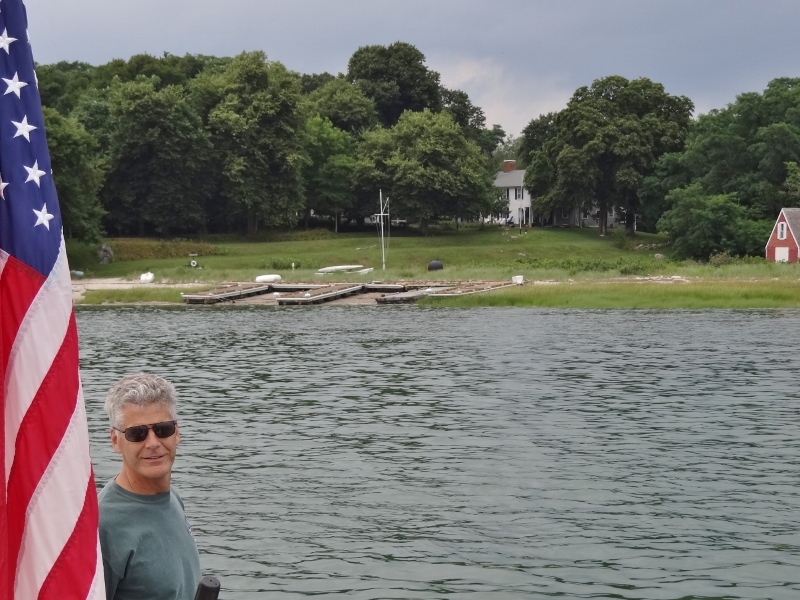 While waiting for Glenn to pick us up for dinner at their lovely home with a harbor view, we saw the person who is our second connection to Duxbury; Kerry’s Uncle Skip. 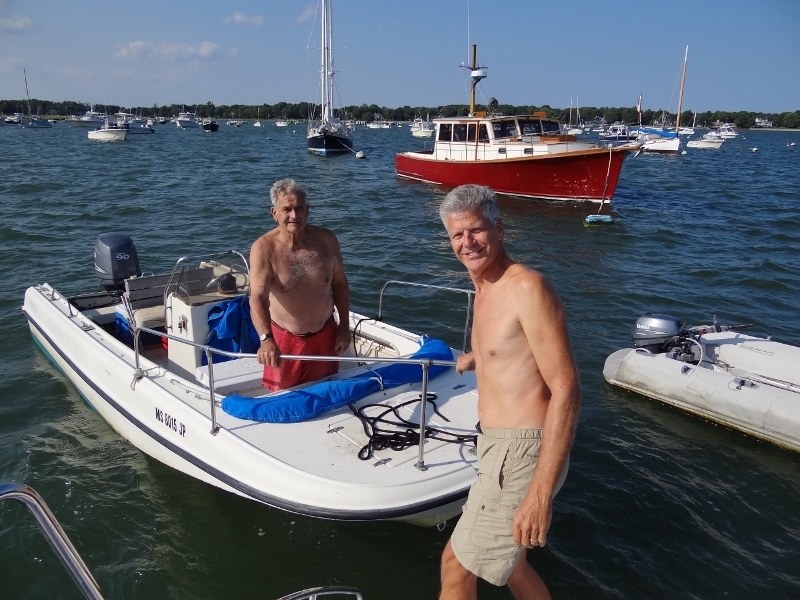 We chatted; mostly talked boat talk and island talk. Hopefully Skip would be able to fit in a visit to Ortolan before we left on Friday. 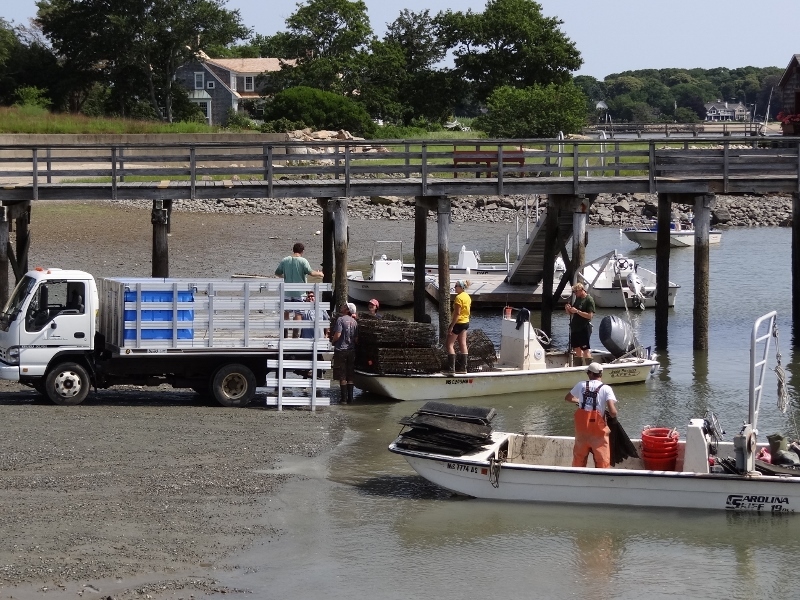 Duxbury Harbor is an oyster farmer’s heaven. 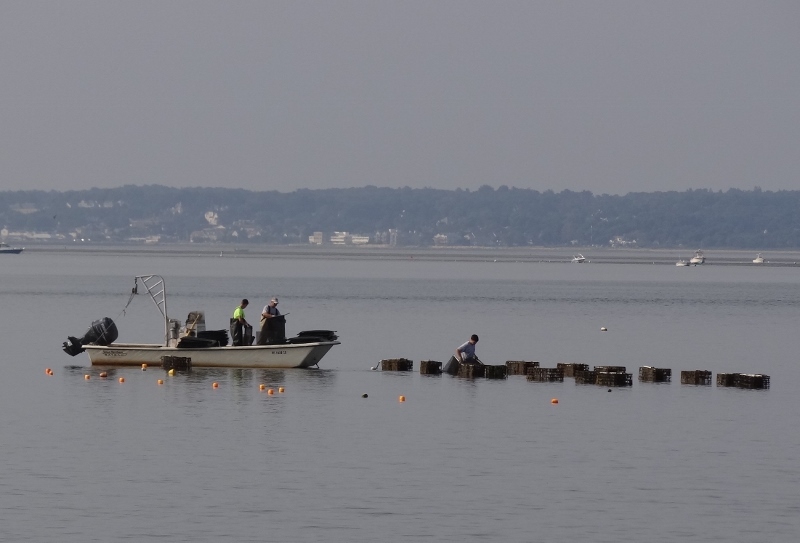 The very shallow waters with the constant ebb and flow are ideal for raising oysters. 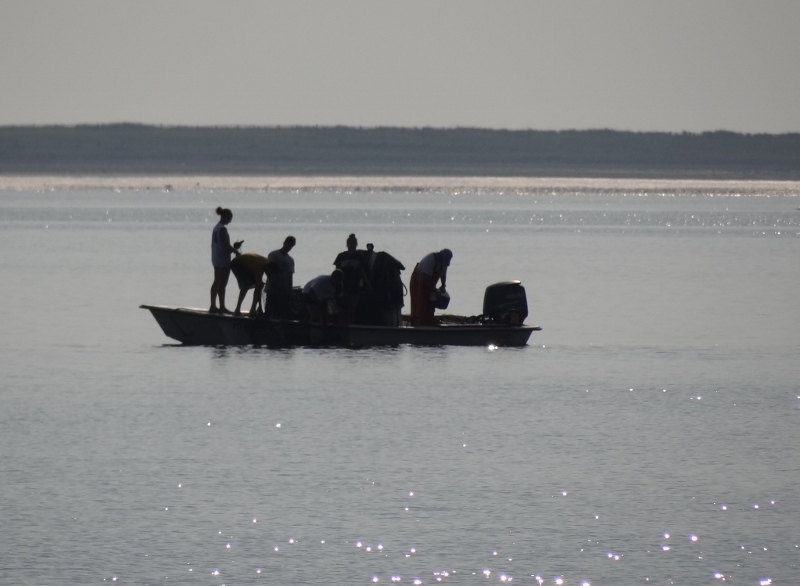 Every day we watched the boats head out and around 3pm they’d start bringing the day’s harvest to the ramp by the YC. Naturally, we managed to find time to visit Snug Harbor Wine & Spirits, the seafood market, French Memories Café and Bakery, Talbots (can you see the 50% off sign calling out to me? 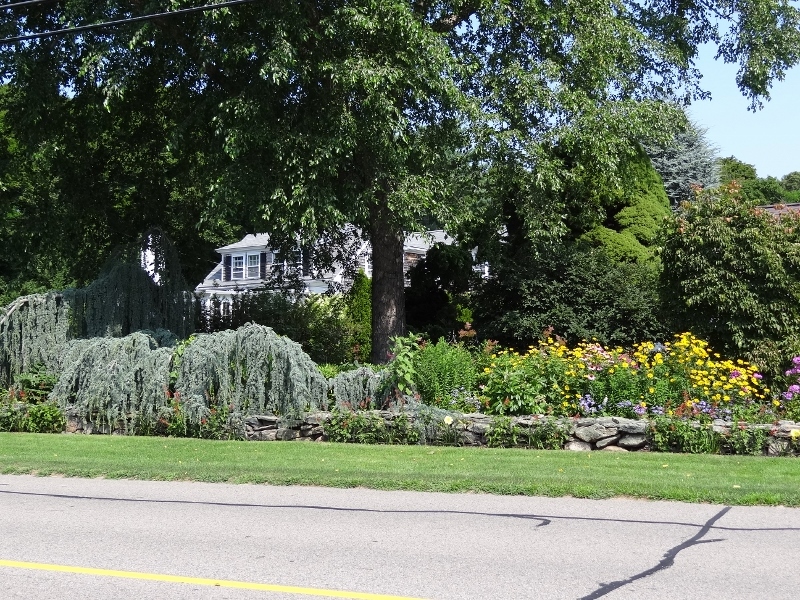 ), dump our trash and recycling and walk about 1 ½ miles toward the town center for a visit to Foodies Grocery Market. 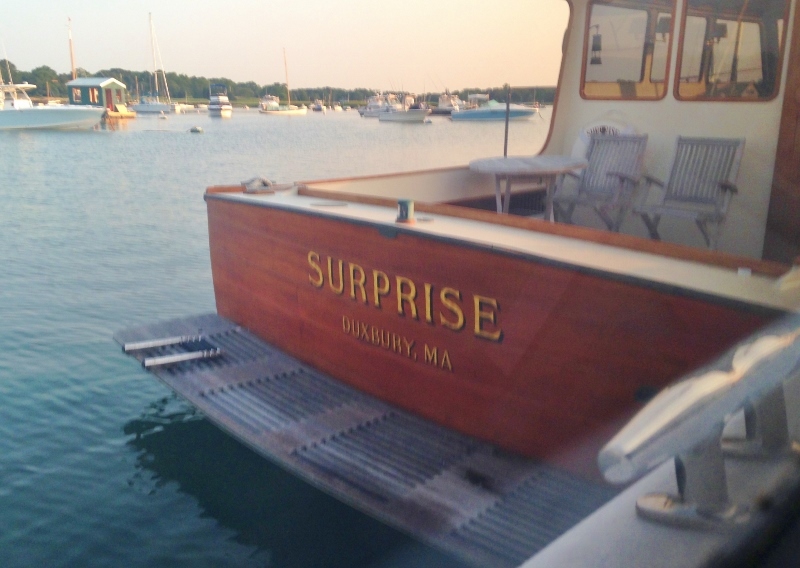 Friday morning we’d planned to head north 15 miles to Scituate and had “reserved” a mooring with EZ Rider. 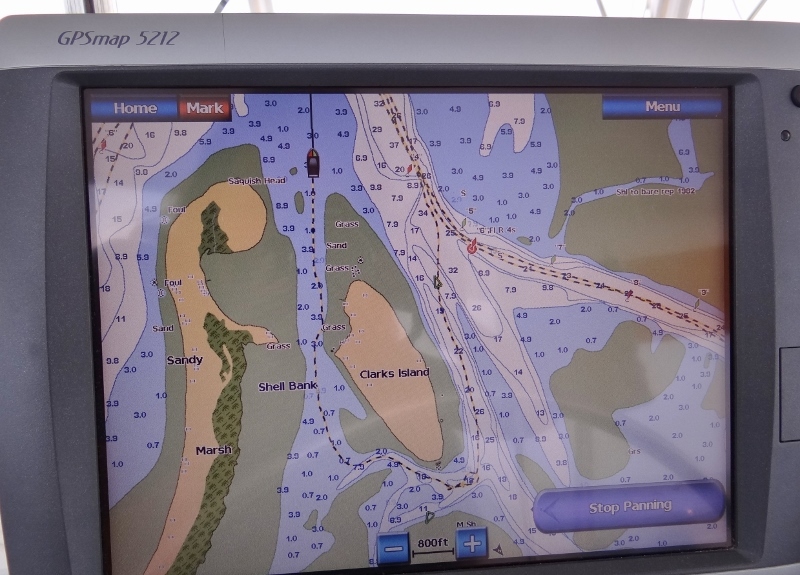 However the Captain decided we needed to circumnavigate Clarks Island and anchor off the “old House” for lunch. Even with a 9ft tide range we wanted a good 6ft over the extremely shallow one foot areas.